Smith-Pelly, who is black, was in the penalty box in the third period after a fight with Blackhawks defenseman Connor Murphy. He was seen becoming visibly upset with fans at the glass to his left, at one point grabbing his stick and walking over to tap the glass with it. United Center ushers removed four fans from the game after the incident. A Capitals spokesperson confirmed to ESPN that the fans were chanting, “basketball, basketball, basketball!” at Smith-Pelly. The 25-year-old discussed the situation with his father. 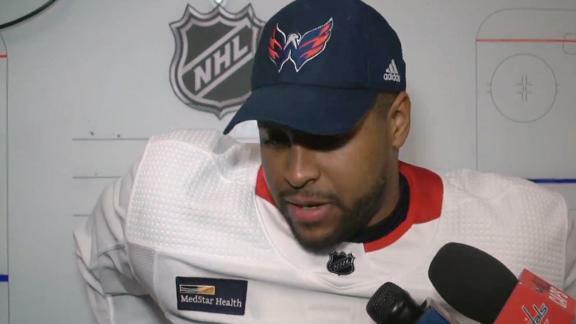 Smith-Pelly couldn’t believe this was happening in 2018. “The League fully supports the actions taken by the United Center and the Blackhawks to eject the offenders and would expect the same response to any similarly unacceptable behavior at any of our arenas,” the statement continued. There are fewer than 30 black players currently on NHL rosters. Smith-Pelly debuted in 2011 and has played 320 games for the Anaheim Ducks, Montreal Canadiens, New Jersey Devils and the Capitals, whom he joined last summer. He has seven goals and nine assists in 54 games. Information from ESPN’s Greg Wyshynski was used in this report.